These days most companies are seeking to adopt a customer-centric vision and strategy in order to deliver an outstanding customer experience, which basically means – a sustained repeat business and increased ROI. Indeed, the key to a thriving business is establishing a base of happy and loyal customers. This is all the more important for an eCommerce business, because unlike brick-and-mortar stores, where customers can browse and ask for assistance, an online store offers no human contact. And when it comes to sales and dealing with customers, we all now how important the human element and a personalized approach are. 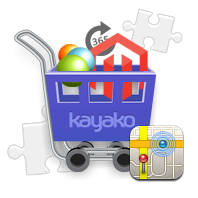 This is why so many online vendors today are trying to improve and personalise their business as much as possible, by implementing, for example, a Live Chat functionality to proactively engage site visitors in a live conversation – one of the multiple features our Kayako Integration for eCommerce has to offer. Given the cut-throat competition raging on the market, your online business simply won’t survive in today’s fast-paced eCommerce environment, unless you provide quality support to your customer. Even if you have a perfectly successful online store, you can never afford to stop improving, as long as you want to stay ahead of your competition. And we believe that you do want to be a big player in your market niche and keep growing your business, don’t you? – Centralize all your customer requests in a single database so nothing is ever missed and everything is searchable from a feature-rich dashboard. – Engage with your clients anywhere and any time via Live chat, screen sharing and click-to-call (VoIP).